Free Shipping Included! Punasi Mini Portable Inhaler, Handheld Ultrasonic Humidifier, Rechargeable Inhaler Machine for Adults Kids - Grey by Punasi at N Online Agency. Hurry! Limited time offer. Offer valid only while supplies last. Features: Cup capacity: 15 ml max. Please Do Not add more than 15ml! Timing: After 15 minutes working, this inhaler will turn off automatically. Cup capacity: 15 ml max. Please Do Not add more than 15ml! Timing: After 15 minutes working, this inhaler will turn off automatically. Power Source: Built-in 280mAh rechargeable lithium battery, rechargeable via micro-USB cable. Lightweight and compact inhaler, which is very convenient to carry and use at home, office, on the go, travel and business trip! Preparation: Clean and Disinfect the container cup, mouthpiece and other accessories before using them for the first time after purchase. Turn on: Press the key button for 2-3 seconds, then Blue-green led light Flickering, press it again, the device will enter into the working condition. Fast & Slow Working modes: After turning on this inhaler, press the button shortly for slow and fast working. Tip: Please make sure the spout Dry! Please use some hot water to clean the water tank regularly for better performance! NEW RELEASED - Micro-porous direct mesh technology, Droplet size: 0.5-5 micron, Suitable for kids and adults. 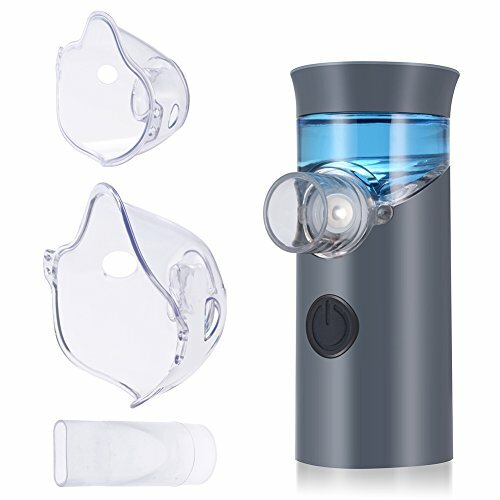 PORTABLE - This mini inhaler dimension measures at 4 (L)*1.6(W) inch, Convenient to carry with the included storage bag! RECHARGEABLE - Ultra-quiet, low power consumption, this cool mist vaporizer is built-in 280mAh lithium battery and can be recharged via included micro-USB Cable. TIMING: Automatically turn off after 15 minutes working. Note: Need to press the ON/Off button manually for continuous work. Wide APPLICATIONS: for beauty skin care, car air humidification, aromatherapy air and dental health care. Perfect for home and travel use.